Frank YangI went into this year’s Canadian Musicfest with a pretty basic plan – see as little as possible. Okay, that’s not really accurate since that would have easily been accomplished by staying home and I was still out four nights in a row, but rather than engage in the club-hopping that the fest usually demands, I opted to choose one thing a night that I was genuinely interested in seeing rather than trek around the city hoping to shake something worthwhile out of the lineup. Wednesday night, that honour went to a show that was one of the more hotly-tipped of the festival, despite being able to count both bands on the bill’s officially-released songs on one hand. Diana may have been a relatively new name on the Toronto scene, but the faces were quite familiar, featuring players whose CVs include Everything All The Time, Donlands & Mortimer, Bonjay, and Warm Myth, to name but a few, but the elevator pitch was that this was the sax player from Destroyer’s new synth-pop project with Carmen Elle of Army Girls on vocals and they’d already arguably gotten more buzz abroad than any of their past projects combined (Destroyer excepted, of course). As someone who came to the band mainly through Army Girls – and was a bit resentful at them for taking Elle’s attention away from her rock project – it was unusual to hear her voice in such a context, surrounded by smooth synth tones and saxophone lines rather than her spiky guitarwork, her voice was more bruised than sultry. Whether by design or happenstance, it created an odd tension between the image she presented as frontwoman; as charming and charismatic as usual, but interestingly at odds with the music would have conventionally presumed. And that applied to Diana as a whole – slinky, soulful synth-pop, yes, but with something else going on in there and it’s that je ne sais quoi that will, unfortunately for me but great for Diana, probably keep Army Girls fans waiting for those albums a little longer. The hype around Scottish trio CHVRCHES has probably put some off of them entirely already, some six months from the release of their debut album, and that’s a shame. Because as far as I can tell, they’re not being posited as saviours of anything, just a new band with some really good songs. Or maybe that new – none of them are rookies in the music biz, with keyboardists Iain Cook and Martin Doherty having done duty in Aerogramme and Twilight Sad, respectively, and singer Lauren Mayberry formerly doing time in Blue Sky Archives. That past experience might explain why despite being a heavily-feted band on their first tour abroad, CHVRCHES were remarkably confident and assured in their Canadian debut. Taking the stage to the strains of an oddly pitch-shifted version of “Let’s Go Crazy”, they opened with last year’s debut single “Lies” and laid out very clearly what they were about – big synth sounds from the fellows and beguiling vocals from Mayberry. CHRVCHES haven’t solved the the inherent problem of how to put on a compelling live show when you’re two blokes tethered to keyboards and girl singer who’s not Sarah Cracknell, but when you’ve got the songs, everything else becomes somewhat trivial. While a fairly static performer, Mayberry wasn’t a wallflower and offered up some charming banter – Ryan Gosling topped her list of things to thank Canada for – the best part of the show was the fact that it proved that their songwriting chops were equal to the hype. “Recover”, with its irresistible chorus, remained the high point of their works so far but everything was fairly bursting with hooks and melodies, led by Mayberry’s youthful and yearning vocals. It’s refreshing that at a time when synth acts are a dime a dozen, one can still stand out by sticking to the time-tested rules of pop music. After closing with “The Mother We Share”, they returned for a one-song encore that bookended the set with Prince salutations and their totally straight but still fun cover of “I Would Die 4 U”. And then they doused everyone with a bubble machine. CBC Music and DIY have interviews with CHVRCHES while NPR has video of one of their sets at SXSW earlier this month. 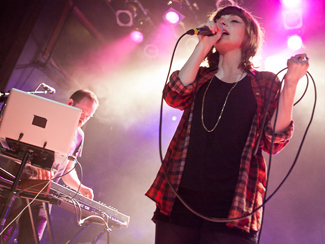 Update: And, just announced, CHVRCHES are back on June 12 at The Hoxton, possibly/probably a NXNE show. Peace takes DIY on a walkthrough of their debut album In Love, out in the UK today. They’ll bring it to NXNE on June 15. CBC Music has an interview with Charles Bradley and an advance stream of his new record Victim Of Love, out April 2, while Clash excerpts an interview with the man. He’ll be at the Phoenix on May 11. Stereogum has an interview with Benjamin Michael Lerner of Telekinesis. Their new album Domarion is out April 2 but streaming now in whole at NPR. They’re at The Horseshoe on May 12. A new Jessie Ware track taken from the inevitable deluxe edition of Devotion – the “Gold Edition” – is now available to stream. It’s out in the UK on April 15, the day before the regular (yet slightly enhanced) version of Devotion gets a North American release. She plays The Opera House on April 6. A track from Kurt Vile’s new record Walkin’ On A Pretty Daze is now available to download. It’s out April 9 and he plays the Toronto Urban Roots Fest at Garrison Commons on July 7. The Postal Service has made another of the unreleased tracks from the 10th anniversary edition of Give Up available to stream. It’s out April 9 and they play The Air Canada Centre on June 11. Room 205 has posted the first of three video sessions with Redd Kross; they’re in town at The Horseshoe on April 11. Loud & Quiet talks to Palma Violets, in town at Lee’s Palace on May 3. Primal Scream are streaming the second single from their new album More Light, out May 6. Deerhunter have announced the May 7 release of their new album Monomania. Typically cryptic details on the release can be found at 4AD. Having let the dust settle from the announcement that their new album would be out in May and be followed by extensive touring, The National have revealed some more pertinent details – specifically that it’ll be called Trouble Will Find Me, that it will be out May 21, and the artwork and tracklisting look something like this. And additionally, in conversation with Gothamist, drummer Bryan Devendorf offers some insight into the recording sessions and what guest artists you’ll hear on the record. The National will headline Yonge-Dundas Square for NXNE on June 14, and the tour documentary on the band Mistaken For Strangers will screen at Hot Docs on April 30, May 2, and May 5. Stephin Merritt has turned his attention to his Future Bible Heroes project, announcing the June 4 release of their first album in over a decade, Partygoing. It’s available either on its own or part of the Memories of Love, Eternal Youth and Partygoing set which includes reissues of their first two albums as well as a bonus disc of rarities. Details on all that at Merge, first track from Partygoing to stream below. Flavorwire is streaming another track from John Vanderslice’s cover album of David Bowie’s Diamond Dogs, which will accompany the June 11 release of his new album of original material, Dagger Beach. The Quietus have confirmed a new Echo & The Bunnymen album is on the way. Ian McCulloch says that it’ll be called The Garden Of Meedlin’ and will be out before the year is out. The Line Of Best Fit has a video session and The Georgia Straight an interview with Veronica Falls. To mark the passing of Jason Molina last week, all of his recorded output as Songs: Ohia, Magnolia Electric Co, or Jason Molina is available to stream. The best way to remember him. NYC Taper is sharing recordings of a Low show in New York last week while Drowned In Sound has a video session and interview with the band.